AVB! AVB! Don't make the same mistake you made in Chelsea. The gist is that France manager Didier Deschamps has indicated that goalkeeper Hugo Lloris is unhappy with comments made by new club boss Andre Villas-Boas, just four days after his move to White Hart Lane. Lloris left Lyon for Tottenham in an £8million move on Friday, with the clear intention of taking the No 1 shirt from Brad Friedel. With Friedel now 41, it appeared Lloris, 16 years his junior, had been brought in with the idea of replacing the veteran American. But Friedel responded to his arrival by producing one of the performances of his career against Norwich on Saturday. That prompted Villas-Boas to say that Lloris would have a fight on his hands to win a starting spot. 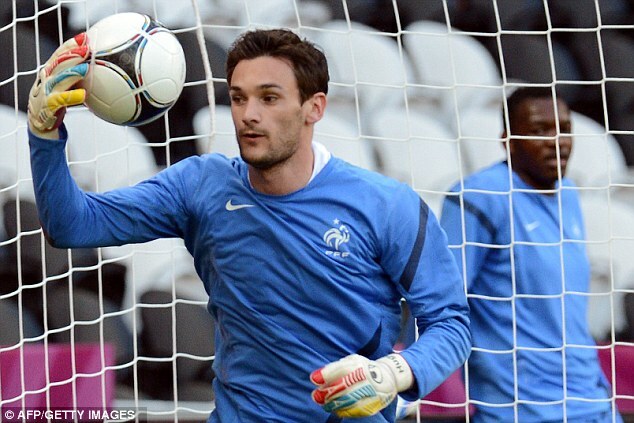 That does not appear to have gone down too well Lloris, who linked up with the national team on Monday. Speaking at their base in Clairefontaine, Deschamps, in comments reported by L`Equipe, said: 'Hugo has not appreciated the statements of his coach. After his side drew 1-1 with Norwich on Saturday, Villas-Boas said: 'Brad is doing extremely well and deserves to be playing and he'll continue to do so. 'He knows about the situation. We had to take this decision bearing in mind that we want to build for the future. So we decided to bring in Hugo now.